This post comes to you after several tantrums episodes of foot stomping because I could not for the life of me get my camera to do what I wanted it to. Yes, I stomp my feet when I am mad. Yes, it's okay because I am only 5 feet, 2 inches tall, and short women are allowed to stomp. And yes, that is an official rule. And really, it was the camera's fault. It's all technical and fancy, with buttons that I don't know how to work - yet. It was simply not cooperating. It also doesn't take kindly to food bribes, which always works with the hubs and Arnold, so I was left with noting else to do but stomp. I am sure there is someone out there who understands my plight. But moving on to the good stuff. I have an undying love for sweet, dark cherries. I love them most when they are fresh and in-season, but for those months when fresh cherries aren't available, I opt for jarred. I usually get the jarred version from a German store near my parents home, which is sadly closing and this is me stomping my feet and being very mad sad about this. So this past weekend, while I was mourning the loss of my little German store, I racked my brain about what to do with a few cans of cherries I had picked up at the store a few weeks earlier (I am hoarding all of my jarred cherries for a later date). I have been wanting to make some sort of corn, cherry muffin bread concoction, but I just wasn't feeling it. Instead, I was craving cake. And since I went to spinning class this weekend, I got to eat cake. That is also an official rule. 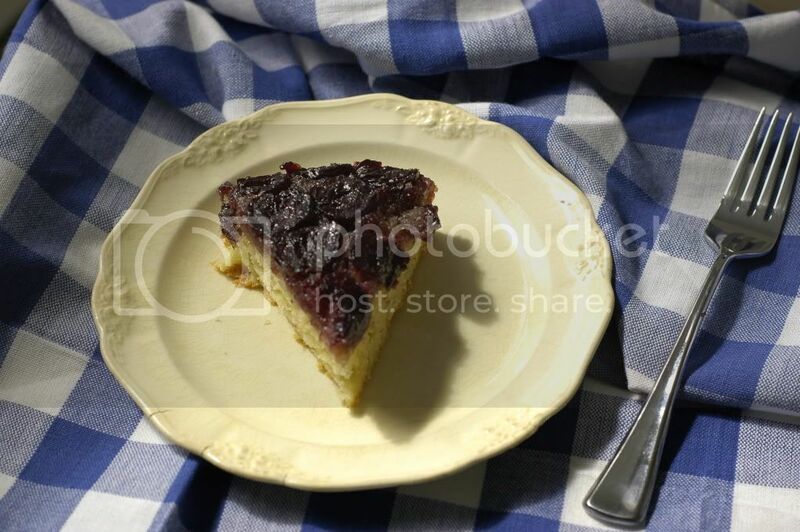 After some nosing around, I happened across a cherry-upside down cake at the Food Librarian. I love upside-down cakes, mainly because of how they look, but also because you get the softness of a cake, coupled with a gorgeous fruit topping that always gets this perfect caramelized edge. In my mind, it's the ideal picnic cake, and I could easily envision myself in some gorgeous field in Europe, sipping wine and eating cake like it's nobody's business. If anyone out there needs someone to be an official European cake eater/tester/whatever, call me. This recipe is originally from Bon Appétit, circa 1997, and I adapted it ever so slightly. I like to do a little recipe throwback every once in awhile, because that's just how I roll (okay, by now you've probably figured out that I am a major dork, and I really appreciate that you've even read this far down the post). But since you have, here is the recipe. This recipe makes one 9-inch cake. Between me and the hubs, we may or may not have eaten the whole thing ourselves over the weekend. Preheat oven to 350°F. Butter the sides of 9-inch cake pan. I used my spring form pan for easier removal later on, but you don't have to. Melt a 1/4 cup of the butter in the cake pan, set over low heat on the stove. Add the brown sugar and almond extract, whisk until well blended. Remove from heat and spread the mixture out into the pan. 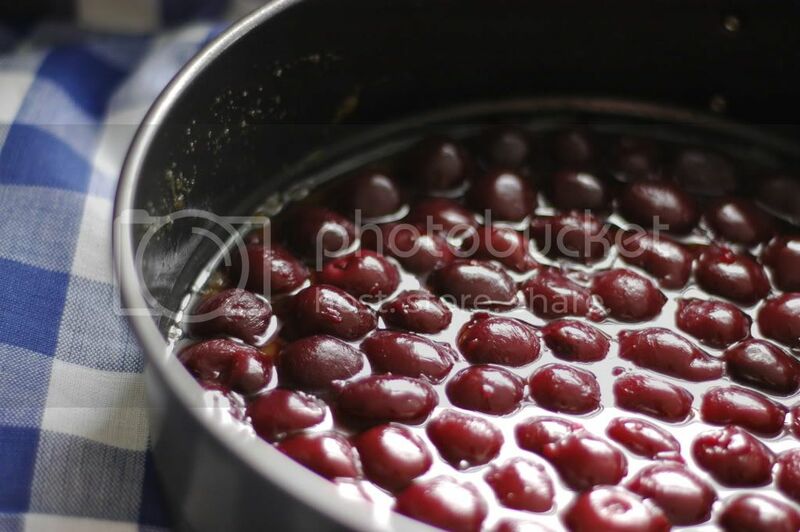 Arrange the cherries, cut side down, in a single layer on the bottom of the pan, pressing them lightly into the mixture to get them to stick. Set aside. Mix the flour, baking powder and salt in medium bowl. Using an electric (or stand) mixer, beat one cup of sugar and the remaining butter in a large bowl until creamy. Mix in egg yolks one at a time, beating well after each addition. Beat in the vanilla. Add dry ingredients, alternating with the milk and ending with the dry ingredients. Using the electric mixer again (with clean beaters) beat the egg whites and cream of tartar in a large bowl until stiff, but not dry. Stir 1/4 of the whites into the cake batter. Use a rubber spatula to gently fold the remaining whites into the batter. 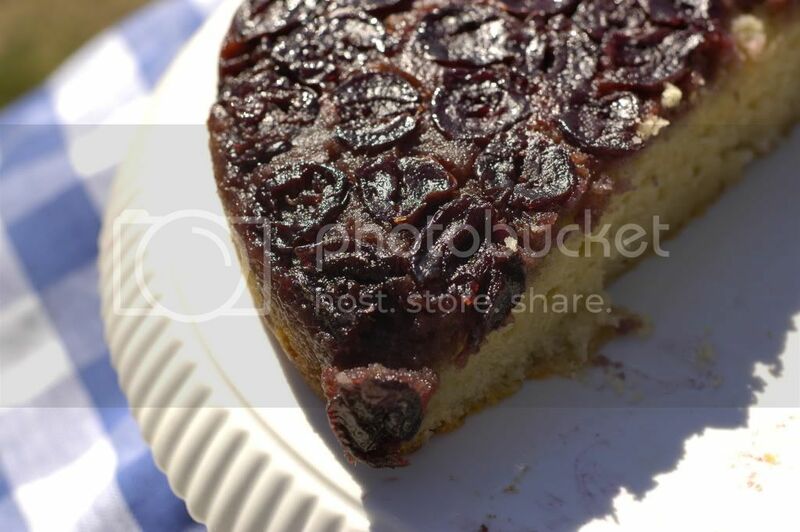 Spoon the batter on top of the cherries. Note - the batter will be thick. Do not worry, it will still turn out beautifully. Bake until the top is a deep golden brown, and a cake tester comes out clean. Depending on your oven, I'd say anywhere from 35-55 minutes. In my convection, it took about 35 minutes. Place the cake on a cooling rack, and let cool - about 20 minutes. Run a small knife around edges of the pan to loosen the cake, and then invert onto a platter or plate. It was really delicious slightly warm, but since I practically ate the whole thing myself in less than 48 hours, I'd say it's good warm, cold, however!